It’s been awhile since I posted a gluten free recipe; I am so sorry my friends! These Gluten Free Lemon Raspberry Muffins are my new favorite gluten free recipe. I love muffins, especially with my large iced latte I drink daily. 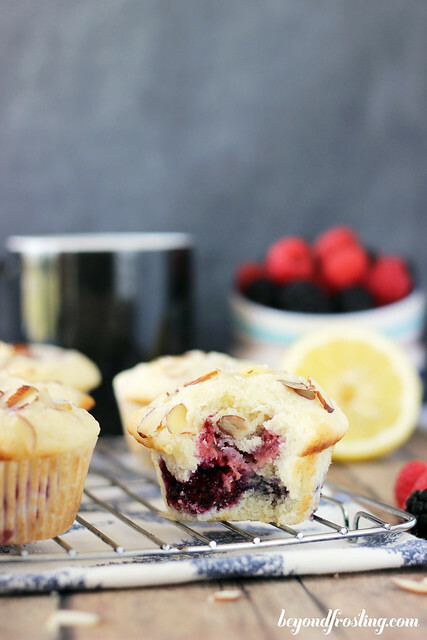 I have so many muffin recipes on my blog, I thought it was time that I made a gluten free version for you. I feel like I have stumbled on gold. 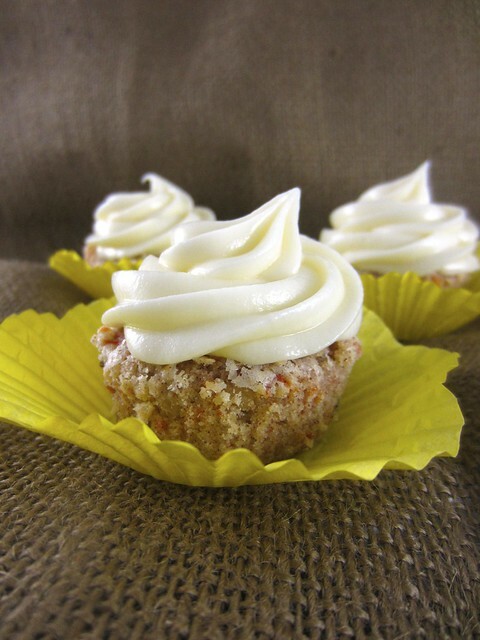 A gluten free muffin full of flavor, with a nice dome and you might never know it was gluten free. 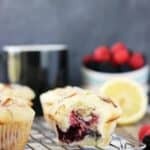 In addition to testing them myself, I’ve asked my gluten free friends for feedback and their results were consistent: the berries are tart, and the muffins are moist and better than what they have found in the average bakery. I have tried a few different gluten free flours and I have to say my preferred brand is King Arthur Flour. It’s a blended flour mix that can be substituted for regular flour. However, don’t forget to add the xanthan gum, or your muffins will be very runny. They still taste fine, but they are most certainly not as pretty. I can tell you that from first hand experience. 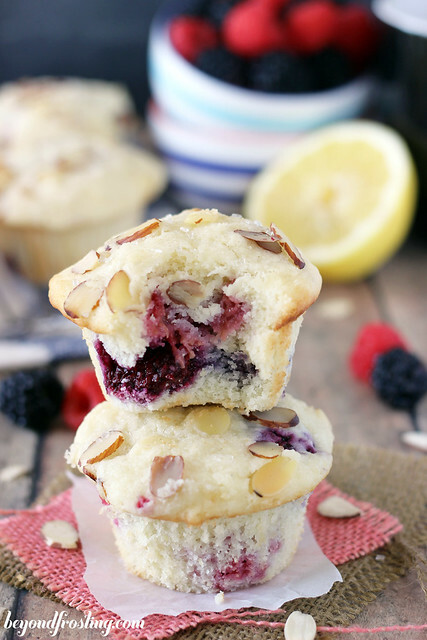 This master muffin recipe can be easily substituted for a variety of flavors or fruits. If you don’t like lemon, you can omit the lemon completely. You can substitute the raspberries for blackberries or blueberries too! The almond extract can also be substituted for vanilla or other flavors. Initially I wasn’t sure if the gluten free flour would react the same in baking to give me a nice round, high dome. By pre-heating your oven to be very hot (425°F), and baking at the high temperature for a few minutes, it will help the muffins rise. Then after five minutes, you can reduce the heat to 350°F. 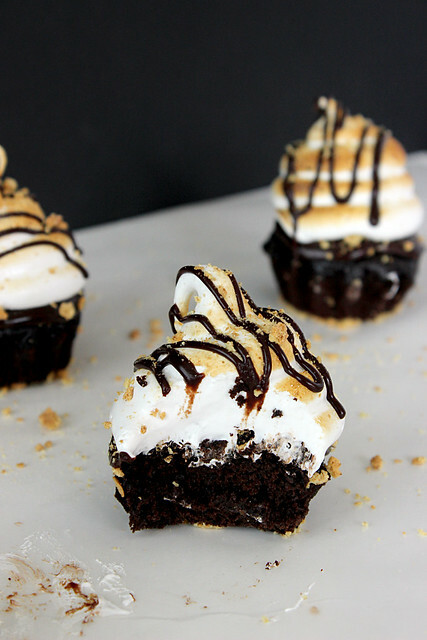 Science equals the perfect dome, and everyone knows the muffin tops are the best part! 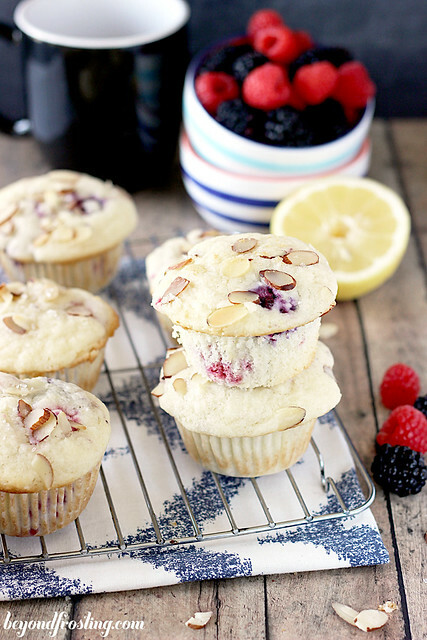 A gluten-free raspberry muffins flavored with almond and lemon. Wash and rinse raspberries. Use ¼ C of gluten free flour to coat the raspberries. Gently stir to coat the raspberries in flour. Set aside. In a medium-sized bowl, measure out 2 ¼ cups of gluten free flour with xanthan gum. Add sugar, baking powder and salt. Stir to combine and then set this mixture aside. In a medium-sized bowl, beat the egg using a whisk until light and fluffy. Add buttermilk and melted butter and whisk together with the egg. Then add almond extract, and sour cream and whisk everything together until smooth. Add fresh squeezed lemon juice and zest into wet mix and whisk until incorporated. 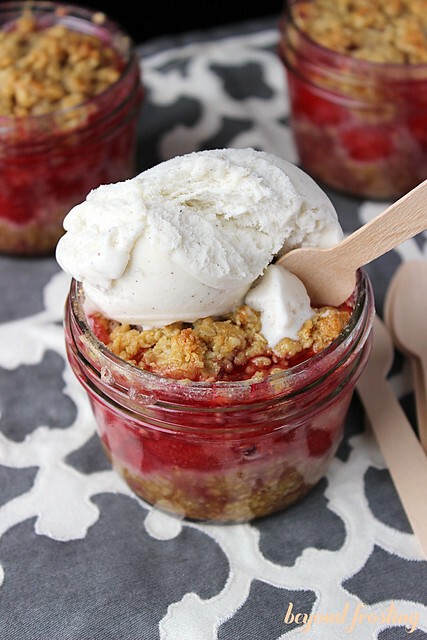 Slowly pour wet ingredients into the dry ingredients and use a wooden spoon to mix just until combined. Your batter will be thicker, but careful not to over mix! Lastly, fold in the raspberries. Do not pour in the excess flour leftover from the berries. 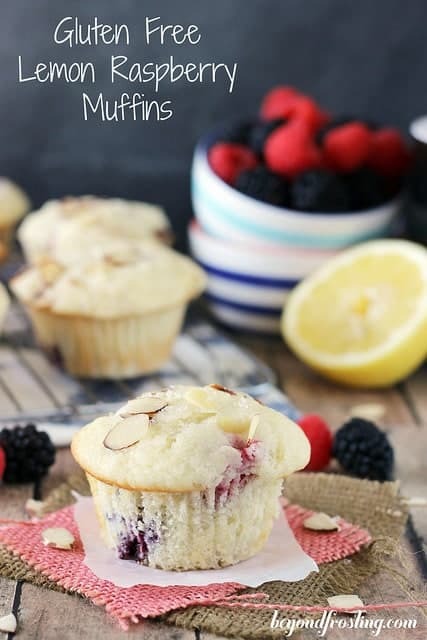 Line your muffin pan and fill your muffin liners all the way to the top with batter. Sprinkle with sliced almonds. Bake for 5 minutes at 425° and then reduce heat to 350° and bake for another 16-20 minutes. Do not open the oven for at least 15 minutes; you will see how nicely the muffins rise. Baking times will vary by oven. When I made the muffins I questioned the 4 tsp of baking powder but followed according to the recipe. Clearly after tasting them I realized that the recipe should have read 1/4 tsp baking powder NOT 4 tsp of baking powder! I should have trusted my instincts. I have made enough baked goods to have caught that mistake. You can taste the bitter baking powder, what a waste of ingredients! Hi Jessica, I am sorry you did not enjoy these. The 4 tsp of baking powder is intentional. Nearly all of my muffin recipes use a similar base. 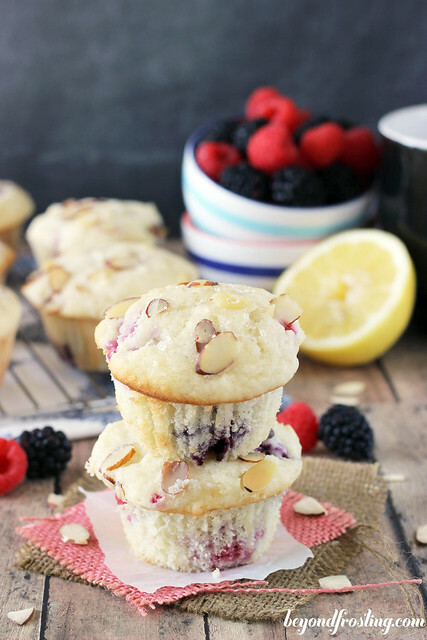 It is to achieve a very high rise with the muffins, similar to a bakery style muffin. My batter tends to be very heavy using a mix of melted butter, oils and sour cream, so extra baking powder is necessary. Actually just last night I made my cinnamon roll muffins and served them today at work. I don’t have that bitter baking powder taste. May I ask what flour you used? Hi Laci, that’s a great question. I’ve never baked with vegan butter or cashew milk, so I can’t weight in. But hopefully someone else will see your comment. If you do try it, please come back and let us know in case someone else might be interested! I was wondering if I could sub the egg for a flax egg and the milk for some almond milk? Have you ever tried this? Hi Lexi, sorry I do not know what Flax Egg is, so I cannot advise on that. You can definitely try this with Almond milk! Enjoy. These were absolutely amazing!!! I mix together BRM and TJ gluten free flour blends to come up with my own. And I used non-dairy sour cream. Thanks for the recipe. Definitely will be making these again and again.